If you have a pet and plan on moving sometime soon keep reading! There are many perks that come with using Premium for a mortgage. One of them being personalized Premium pet tags. Moving to a new home can be quite an adjustment for everyone, including our four legged family members. To make them feel at home -- as well as safe and secure -- we create pet identification tags with updated address and contact information to the pets of new home owners. In the past year alone, we've sent 1,450 pet tags to 915 new homeowners. Brian from Premium's marketing department does all the engraving. This is very advantageous because we get a behind the scenes look at how they are made. 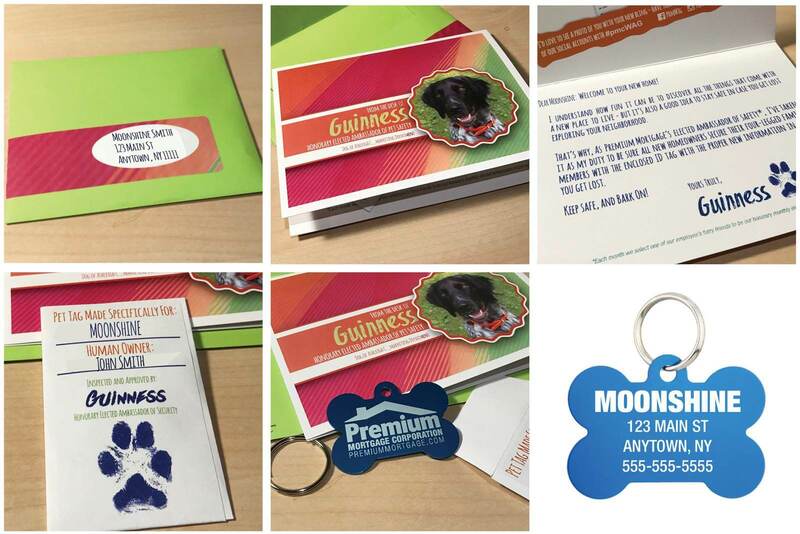 Pets of new homeowners are sent their new tags directly with personalized packaging. This is a sample collage of what customers receive in the mail after they close on their house. The packaging features Premium's Ambassador of the month. Each month, Premium employees vote for an Honorary Ambassador of Pet Safety. The pet with the most votes is chosen tobe featured on all after close pet tag mailers for that month. Customers who have received a pet tag from Premium are encouragedto snap a photo of their pet wearing their tag, upload to Facebook, Twitter, or Instagram and include #pmcWAG in their caption. Premium has held #pmcWAG photo contests in the past. One of the contests held in 2016 was not exclusive to Premium Mortgage customers. Anyone was able to order a free Premium pet tag to use in their photo submission. Winners of this specific contest won up to $500 in the form of a Visa gift card. More behind the scenes look at how Premium pet tags are created.